Often- well, maybe not "often," but every now and then- I hear criticism that goes something like this: "Yeah, your UI controls look cool and work well in your simple little demo apps, but where can I see them working in the real world?!" It's a fair critique. After all, nobody at Telerik is ignorant to the fact that the applications you're building with our controls are much more complex than the demos we usually put out there. Largely this is to keep the demos simple enough to still be usable as learning tools (imagine trying to use your massive project as a learning tool......), but still, no excuses! You want some real-world proof that our controls really are the best out there! I'm pleased to announce that after a number of month's of work, Microsoft has begun rolling out Telerik's RadControls for ASP.NET AJAX on its MSDN and TechNet websites. How's that for real world use?! In this initial roll-out, Microsoft has replaced the rich text editor in their Wiki Annotation feature (used to add and edit Community Content in the MSDN and TechNet libraries) with the RadEditor for ASP.NET AJAX. 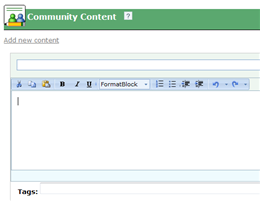 If you ever add Community Content on the MSDN and TechNet websites in the future, you'll be using the RadEditor. To see the RadEditor in action, you will need to login to the MSDN or TechNet website with your LiveID. The partnership with Microsoft is also benefiting the RadEditor for all Telerik customers as we work hard to add features and maximize performance with Microsoft's valuable feedback. So while survey-based awards and niche industry awards are good to have on your shelf, being able to point to your controls as Microsoft's choice for UI components on MSDN and TechNet (I think you'll agree) is much more valuable. Watch for more great announcements stemming from this partnership in the future, and in the mean time, enjoy developing with the tools the guys and gals in Redmond use. Very nice use of the RadEditor as well! Thanks for pointing that out, Mark! i am getting an error like this when i am running my application i am using radcomboBox.what this error means.